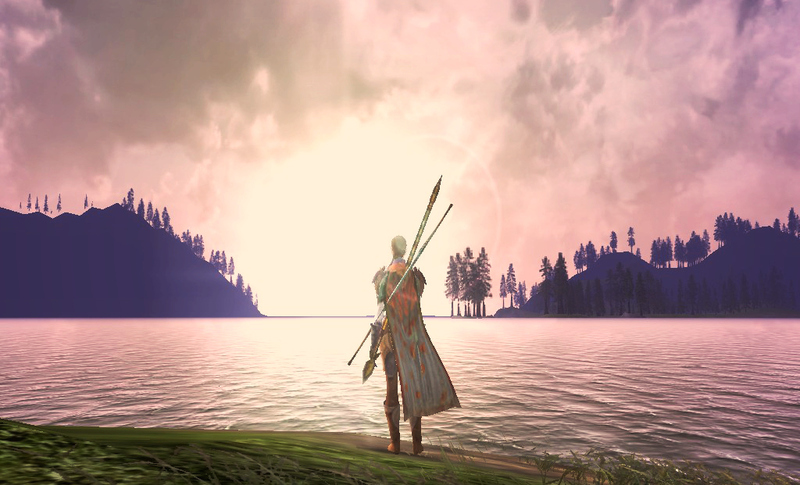 Eruviel rode in the midst of the troop of fifty Rangers along the shore of Nenuial. Ignoring the murmur of discussion around her, she fixed her sullen, green eyes ahead of the riders. A new, younger captain named Terhun lead their march, and she and he did not quite see eye-to-eye. The rendezvous with Aloeer could not happen soon enough. “I do not pout,” she replied flatly. Can I not go one afternoon without you making me smile? It was a rare day indeed when the elf maiden wanted to frown, or at least remain expressionless. Cade nodded slightly as he followed her gaze. “They should have returned by now, but it is a wide land, and they are some of the best we have. “A man who’s optimism dwarfs my own,” she muttered, amusement trickling into her voice. Unable to keep it back, her face finally cracked a smile. “Tell me again about your cabin, heruamin,” she said. Cade loved to tell her about his cabin up in the mountains, and she loved to listen to his rich-toned voice and the hope it carried. His home had to be the most perfectly quaint, hidden valley a man could have hoped to stumble upon. Late nights he would paint mental pictures for her of the crystal spring that bubbled out of the rock and flowed into a small lake. He told her of the groves of coniferous trees, the rolling green hill the house was built upon, and how the stars seemed to dance around the valley at night. He had mentioned it several years back, and from stories and suggestions there grew to be an understanding that after this last appointment he would take her there. His subtle excitement made her want to spur her horse into a run to get the journey over with. Listening to him talk about how he found the valley, and how he’d built the house, fashioned with both human and elvish designs made the time pass with ease. After the battle when she had first found Ge’bar was when Cade had left for several years before returning, trusting the secret of his home to her with a serious reverence. They had always been like that. Not even Milloth knew of the affection between the Human and Eldar that had grown over the fifteen years that they’d been friends. They had never spoken of it. Not even had they touched except in the smallest of ways when brushing hands passing a pint or fighting back to back and the like. It was a quiet, mutual tenderness; a feeling of completion. Riding over the next rise the troop of Rangers suddenly grew silent. They all finally sensed what had been plaguing Eruviel for miles. She noted that the scouts had not yet returned. Two groups of three were motioned to fan out ahead and into the woods on the mountain side of the main force as they continued forward. Eruviel and Cade pulled out their bows and the rest of the men followed suit. Terhun stopped their advance and pulled out a folded piece of parchment that had been handed down three ranks before being entrusted to his hands. Their marching orders. “Aloeer should be here,” he said quietly. The men parted as Terhun turned his horse to walk back into the ranks, and that was when she saw it. The trap hidden beneath fallen logs and leaves. “Stop!” she cried, lurching forward with an arm outstretched towards the captain. But it was too late. Terhun’s horse hit the trigger and a spiked branch flung out of the shadows, striking a killing blows to the man’s horse. Terhun fell to the ground and as the wounded horse let out a scream every horse panicked as a barrage of arrows whistled through the trees into the group. “Kaita, Marisily,” Eruviel ordered in a whisper as she ducked down to avoid being shot. In the chaos her horse quickly obeyed, laying down on its side as many of the other mounts fell or fled. Dropping to the ground she loosed volleys of arrows into the trees, hearing her arrows hit their hidden targets nearly every time. Cade knelt behind her, firing in the opposite direction. Nearly thirty of the original fifty Rangers remained alive. Just as the arrows ceased to fly a shout rose from around them and brigands leapt out from the trees to fall upon the Rangers. Gauredain and criminals tore into their ranks, ten falling to every Ranger. No, even more. Having been in the middle of the troop when the attack began, Eruviel and Cade had the advantage of some cover, loosing their arrows quickly as if in one seamless, continuous motion. “This must be Sickleaf’s band!” Cade shouted back to her. “On your right!” she called back mid-shot. He redirected himself and loosed several arrows. “But where is the coward?” she asked. Only ten Rangers remained. Turning to shoot in the other direction her sight landed on the leader of the brigands as she dropped the man next to him. Bran Sickleaf met her gaze, pointing a crossbow back at her, his hand squeezing the trigger. In the distance the approaching thundering of hooves could be heard. Her next arrow was almost out of her quiver when she was suddenly grabbed and thrown to the side. Hitting the flank of another fallen horse, the arrows that pierced its hide breaking beneath her, she rolled over the ground, scrambling to find her footing. Rising up, her eyes looked back just in time to see Cade deflect one bolt with his sword, and catch one with the arch of his bow as two others struck him, knocking him back. Unable to draw a breath she ran back over the corpse-covered ground to fall by his side. One bolt jutted out from his shoulder, the other from his lower right chest. There was no doubt that the second had struck his liver, and bile rose in her throat as she pressed down on the wound in attempt to stop the bleeding. “Cade? Cade,” she begged frantically, using one bloodied, trembling hand to move his long, dark hair out of his eyes. “E-Eruviel,” he coughed, reaching a hand up to cup her face. “Shh, shh,” she hushed him as she bent closer, the long, loose hair from her forehead dangling down to brush his face. “Tampa; do not speak, beleger. You must hold on.” Please. Shaking his head he managed a garbled chuckle. “As long as you are alright, I am content.” His fingers combed through her hair and pulled her down to him, his lips meeting hers for a soft, brief moment. Releasing her he opened his mouth to speak but the air slowly whispered out of his lungs and he closed his eyes in one last, faint smile as his arm dropped limp by her side. She could feel them watching her, those who were not fighting. She could feel Bran’s cruel eyes observe her from a distance as she crossed Cade’s arm’s over his chest. She could feel the beast that she had met in the Barrow Downs and who had shown itself the day she saved Ge’bar rise up from its slumber and take hold. Her limbs stopped shaking, her breath steadied, and her hand closed over the hilt of Cade’s dagger. Whirling around her blade sliced across the gut of a Gauredain and came up to pierce under the wild man’s chin, the tip showing just above his wolf-head cowl. Pulling the dagger out she turned to meet the gaze of Sickleaf. Her green eyes darkened, turning nearly black, shining cold and bitter as she stepped gingerly over the bodies. She deflected another bolt from the brigands crossbow, turning just slightly to cut down a criminal that dared to get close with little effort. Half of the remaining brigands ran as she approached them, the other half ran when Aloeer and his men rode on to the scene. “Eruviel!” Aloeer called out to her, jumping down from his horse as the others searched for survivors. Stopping under the edge of the treeline she stared out, watching Bran Sickleaf run away, stumbling as he looked back at her. “Do not wait for me,” she said quietly. “Eruviel, what happened?” the man asked, taking her arm as she stepped away from him. Swinging herself up onto Marisily’s back the horse jumped forward, reading her mistresses emotions and the sense of urgency. Eruviel could clearly see the path Bran had taken. Bow in one hand she galloped through the dense forest, her sure-footed mount weaving through the maze of trees at Eruviel’s guidance. The black faded from her eyes to be replaced by a green as cold as the ice shelves of Forochel. She wanted to weep, and scream, and hide herself from the world. A shout of alarm sounded from up ahead. You fools. Your spell has worn off and I can sense you a mile away. Bracing herself with her knees she sat up and knocked an arrow in her bow. She could see them. Passing one, three, then six tree she loosed the arrow, quickly following it with another. The two men running with Sickleaf dropped with a sickening thud. Shouting in horror and surprise, Bran turned to run up a steep rock slab that led up the side of the feet of the mountains. “You still run from me, Bran?” she called up to his fleeing figure. Leaping from Marisily’s back, Eruviel shouldered her bow and sprinted up the steep slope with little effort and every grace of her race. She felt nothing; not pain nor exhaustion. The steep climb only seemed to invigorate her, and the only thing she did feel was the drive to catch the murderer and make him pay. She had been told of him before, and many had tried to stop him. His heritage came from killers, thieves and rapists. His family served the dark powers of the world with abandon; hunting down those who strove to live good, honest lives. Now she hunted him. The slope was higher than she thought. The rock ended, extended in a patch of grassy earth before more stone stretched to the sky. Eruviel was ahead of him now. Her hands gripped her dagger in one hand and Cade’s in the other. I will not let him get away with this, she thought darkly. A small, cruel smile curved her lips as she hid just out of sight. I am a part of this world . . . of this war, and though I suffer as they do I will not flee across the sea. Looking up, her now-frosty green eyes saw Bran scramble up over the ledge, glancing behind him in panic. The brigand stood maybe an inch shorter than she. He was not a large man, but his lithe body was built and hardened from the harsh life he led. He will pay. A cocky smirk awoke on his face. “And I have heard of yours. The Lady of Mercy. Come to kill me for murdering your friend?” The words were no sooner out of his mouth before Eruviel shot forward. She could feel his jaw bone flex and crack, and the skin of his face under her knuckles split. Unprepared for the force of her strike, Bran flew backwards to tumble down the smoothed stone slope. Not stopping, Eruviel followed, half running half sliding down the steep incline. She wanted to beat him to a bloody pulp. He had taken the one man she respected and cared for from her. She wanted to make him watch Cade’s funeral pyre from a noose. A dozen tortures and even more deaths crossed her mind as she stared at him. Her long silence made the man visibly uncomfortable, and it was then she knew. She had to be the master of the beast that tore at her from inside. There was little law out in the wilds. He answered to her justice and she answered to her conscience.